Many flowers growing in our gardens are edible. Flowers fit for food have been used for thousands of years in cooking and as garnish for a huge range of dishes. The Chinese were first to have been recorded experimenting with flowers as food, and their varied recipes can be traced back as far as 3,000 B.C. Romans used violets, roses and pinks in dishes, and lavender in sauces. Gardeners and cooks over 1,000 years ago were using pot marigolds and orange blossom in their cooking. It's always best to grow your own edibles so that you can be sure they're clean and free from disease. Edible flowers are always best freshly-picked anyway. 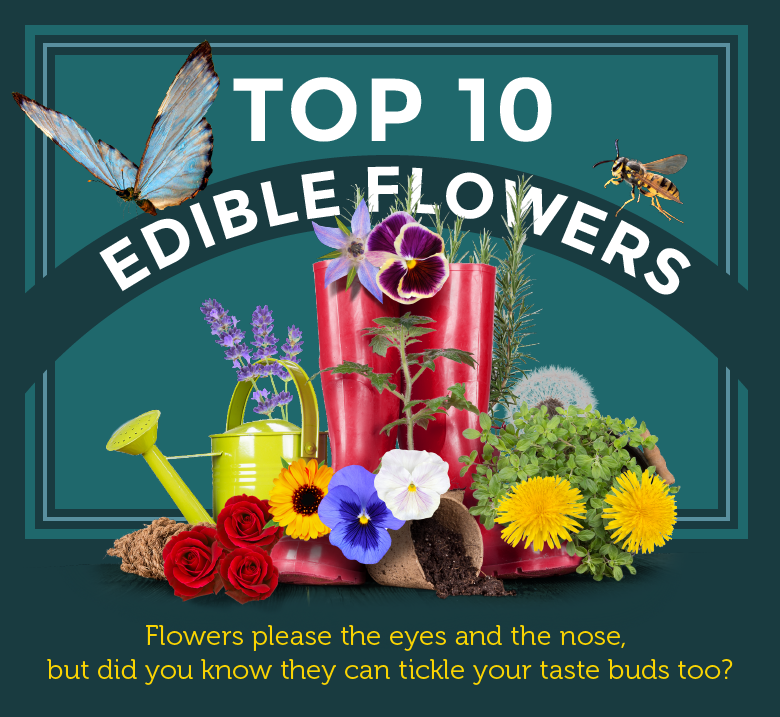 If you?re in any doubt as to whether or not a flower is edible, don't eat it. It?s a simple but effective rule of thumb. Also, if you're allergic to pollen, you might want to avoid eating flowers altogether, just to be on the safe side. Disclaimer: Van Meuwen has researched all the edible flowers listed below. However, individuals consuming the flowers, plants, or derivatives listed here do so entirely at their own risk. Van Meuwen always recommends following good hygiene practices. Van Meuwen cannot be held responsible for any adverse reaction to the flowers. In case of doubt please consult your doctor. 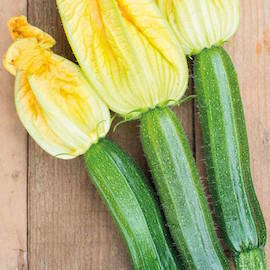 Courgette Cucurbita pepo All squash flowers have a slightly sweet 'nectar' taste. These can be stuffed with cheeses and other fillings, battered and deep fried or sautéed and added to pasta. Thinly sliced blossoms can be added to soups, omelettes, scrambled egg or used to add colour to salads. Daisy Bellis perennis Pull flowers apart for a mass of small quill petals ideal for creating a colourful garnish on desserts or soups, in salads or with savoury dishes. Also make useful decorations for cakes, biscuits, mousses and pÃ¢tés. If you have hay fever, asthma or severe allergies, you should avoid eating flowers of the daisy family because they could trigger an allergic reaction. Daylily Hemerocallis Day lily petals are great in salads, hot and cold soups, cooked and served as a vegetable or chopped and added to stir-fries. Try sautéing the buds or flowers, which can then be stuffed with almost any filling. Only hemerocallis, the 'Day Lily' can be eaten. Do not eat other types of lilies (Lillium) as they are poisonous. Nasturtium Tropaeolum majus, Tropaeolum minus The fresh leaves and flowers have a peppery flavour similar to watercress. The flowers will add a spicy touch to salads and the green seeds can be chopped and used with parsley as a garnish or made into capers. Try them combined with cream cheese or butter in canapés, or in a cheese and tomato sandwich. Flowers can also be used to garnish steaks or casseroles. Pansy Viola x wittrockiana Flowers have a lettuce-like flavour and make a decorative addition to a green salad or to garnish a pÃ¢té or dessert. They can be crystallised and used to decorate cakes, cookies or creamy desserts. Peony The petals can be added to salads, or cooked slightly and sweetened for a treat. Peony water once also once considered a delicacy and the blooms can be floated in punches. Sage Salvia officinalis The flowers taste similar to the leaves and make a vibrant contribution to salads and pÃ¢tés, mustards and vinaigrettes. Viola Viola cornuta, Viola hybrida, Viola tricolor, Viola x williamsiana, Viola odorata Flowers have a lettuce-like flavour and make a decorative addition to a green salad or to garnish a pÃ¢té or dessert. They can be crystallised and used on cakes, cookies or creamy desserts. Disclaimer: Van Meuwen has researched all the aforementioned edible flowers. However, individuals consuming the flowers, plants, or derivatives listed here do so entirely at their own risk. Van Meuwen always recommends following good hygiene practices. Van Meuwen cannot be held responsible for any adverse reaction to the flowers. In case of doubt please consult your doctor. 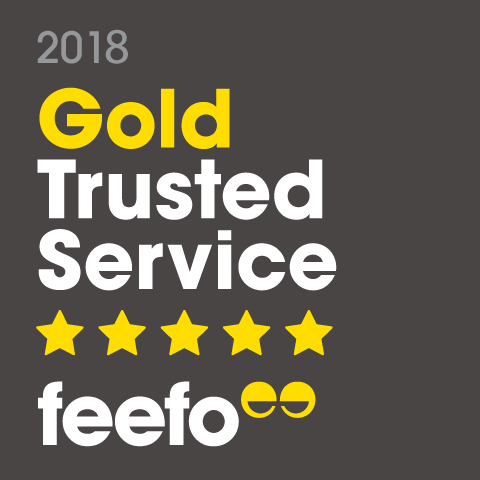 Although there are probably many more flowers in the garden which can be eaten safely we would recommend that you confine yourself to trying the ones mentioned here and avoid anything that has not been widely recommended. Click here to view the common garden flowers which are ALL POISONOUS to a greater or lesser degree and should be especially avoided. 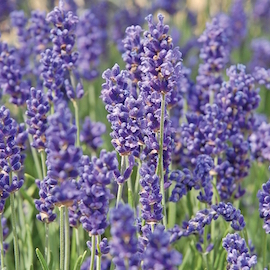 Lavender Hidcote is just one of many varieties suitable for flavouring and garnish. 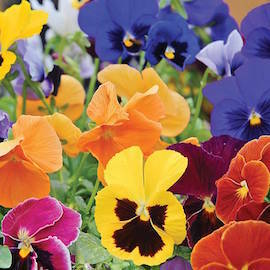 Pansies can help brighten up a salad, or even your pancakes!